In the 1820s the port of Baltimore was in danger. The threat came from the newly opened Erie Canal (see "Traveling the Erie Canal, 1836") and the proposed construction of the Chesapeake and Ohio Canal that would parallel the Potomac River from Washington, DC to Cumberland, MD. These new water routes promised to provide a commercial gateway to the West that would bypass Baltimore's thriving harbor and potentially hurl the city into an economic abyss. Something had to be done. The local entrepreneurs looked across the Atlantic to England and found an answer in the newly developed railroad. In 1828, the Maryland syndicate, led by Charles Carroll - a signer of the Declaration of Independence - broke ground for the Baltimore and Ohio Railroad. The railroad's objective was to connect Baltimore with the Ohio River and the West. 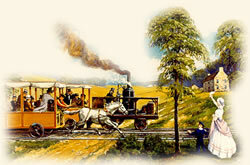 Initially, the railroad's power was to be provided by horses. However, it soon became obvious that animal muscle was no match for the long distances and mountainous terrain that would have to be traveled. The solution lay with the steam engine. By 1830, the B&O Railroad had extended its track from Baltimore to the village of Ellicott's Mills thirteen miles to the west. The railroad was also ready to test its first steam engine - an American-made locomotive engineered by Peter Cooper of New York. It was a bright summer's day and full of promise. Syndicate members and friends piled into an open car pulled by a diminutive steam locomotive appropriately named the "Tom Thumb" with its inventor at the controls. Passengers thrilled at the heart-pumping sensation of traveling at the then un-heard speed of 18 mph. The outbound journey took less than an hour. On the return trip, an impromptu race with a horse-drawn car developed. The locomotive came out the loser. It was an inauspicious beginning. However, within a few years the railroad would become the dominate form of long-distance transportation and relegate the canals to the dustbin of commercial history. "...it was determined to have a race home." Mr. Cooper's success was such as to induce him to try a trip to Ellicott's Mills; and an open car, the first used upon the road, already mentioned, having been attached to his engine, and filled with the directors and some friends, the speaker among the rest, the first journey by steam in America was commenced. The trip was most interesting. The curves were passed without difficulty at a speed of fifteen miles an hour; the grades were ascended with comparative ease; the day was fine, the company in the highest spirits, and some excited gentlemen of the party pulled out memorandum books, and when at the highest speed, which was eighteen miles an hour, wrote their names and some connected sentences, to prove that even at that great velocity it was possible to do so. The return trip from the Mills - a distance of thirteen miles - was made in fifty-seven minutes. its way back. From this point it was determined to have a race home; and, the start being even, away went horse and engine, the snort of the one and the puff of the other keeping time and tune. At first the gray had the best of it, for his steam would be applied to the greatest advantage on the instant, while the engine had to wait until the rotation of the wheels set the blower to work. The horse was perhaps a quarter of a mile ahead when the safety valve of the engine lifted and the thin blue vapor issuing from it showed an excess of steam. The blower whistled, the steam blew off in vapory clouds, the pace increased, the passengers shouted, the engine gained on the horse, soon it lapped him - the silk was plied - the race was neck and neck, nose and nose - then the engine passed the horse, and a great hurrah hailed the victory. But it was not repeated; for just at this time, when the gray's master was about giving up, the band which drove the pulley, which drove the blower, slipped from the drum, the safety valve ceased to scream, and the engine for want of breath began to wheeze and pant. In vain Mr. Cooper, who was his own engineman and fireman, lacerated his hands in attempting to replace the band upon the wheel: in vain he tried to urge the fire with light wood; the horse gained on the machine, and passed it; and although the band was presently replaced, and steam again did its best, the horse was too far ahead to be overtaken, and came in the winner of the race." John Latrobe's eyewitness account was originally published in: Latrobe, John H. B. The Baltimore and Ohio Railroad: Personal Recollections (1868), reprinted in Hart, Albert B. (ed.) American History Told by Contemporaries vol. 3 (1927); Mack, Edward C., Peter Cooper, Citizen of New York (1949). "America's First Steam Locomotive, 1830", EyeWitness to History, www.eyewitnesstohistory.com (2005). Peter Cooper, constructor of the "Tom Thumb", invented the gelatin dessert Jello in 1845. He also founded the Cooper Union for the Advancement of Science and Art in New York City in 1859.